Laba Porridge is one of traditional Chinese food, popular all around China. 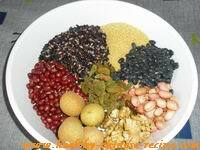 It contains many beans and seeds which are full of energy. Here is recipe and pictures. Nutrition Benefit of Laba Porridge: Supplement blood and Qi. You can add in different materials and ingredients according to your own health conditions. People who are prone to indigestion and bloating after a meal should add less soybean or black soybean, but should add more malt, brown rice, and glutinous rice. Diabetics shouldn't add white rice, glutinous rice, Chinese date, or raisin but should add more buckwheat, oat, and all kinds of beans. 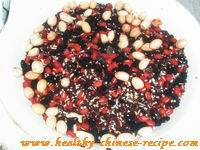 People with stomach cold-pain shouldn't add mung bean or buckwheat, but should add more red glutinous rice, Chinese date, etc to warm up stomach and promote spleen Qi. 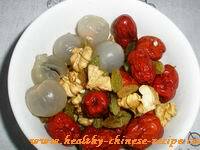 People with amnesia or insomnia should add more lotus seeds, peanut, longan, wild jujube seed, walnut, and Chinese date. People with chronic cough should add more apricot, Chinese date, and ginkgo. 1. Wash Cereals & Beans, soak in 2 cups of water overnight. 2. Wash Dried Fruits, set aside. 3. 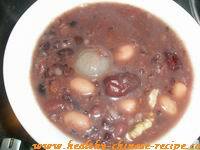 Add Cereals & Beans plus Chinese date and soaked water in a pot. Fill with 6 cups of water. 4. 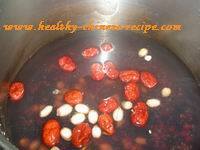 Bring to a boil, simmer for 90 minutes over low heat. Constantly stir to prevent burned. 5. Add in Dried Fruits and crystal sugar. Continue to simmer for 30 minutes. 6. Turn off heat. Stay for 10 minutes, serve with vegetable dishes. Tips: 1.You can add addional raisin when serving. It's tasty. 2. This porridge can be cooked the whole year. You can add mung bean or Lily bulb in summer. (Clear away summer heat).